And just like that. She’s two. To the one who made me a mama, I hope you have the happiest of days. I remember being so proud the day I had you. I kept looking around thinking, is everyone seeing what I’m seeing?? This is one special girl. And I’ve felt this same way every day since. That smile and sass brings a whole lot of joy to this family and to the world. Here’s to another year of YOU my sweet girl! Eating at Big Girl Table! Moving to Her Girl Room! AND Becoming a Big Sister! Good morning! Hope you all had a great weekend! We had an absolute blast with family this weekend up in Madison. There will definitely be a recap coming later this week! Today, I wanted to share some goodies I have been eyeing and while I would like to say not every goody round-up post I share will include baby stuff–I cannot resist. Buying baby items not only makes it feel real, everything is also so yummy. So small, so soft, so darling! I have been buying a few things here and there if I find a good deal–trying not to go too overboard! Here’s what I am loving this week! 1. I want all the baby bear stuff. As you can tell from our announcement post, we love da baby bear theme. I say we keep it going with this darling pennant. 2. I haven’t had any cravings per se, but I have upped my ice cream intake slightly. This local favorite has me drooling. 4. The cutest teether you ever did see. 5. These darling jeans are out of stock–so bummed! Is there anything cuter than skinny jeans on a baby? 6. 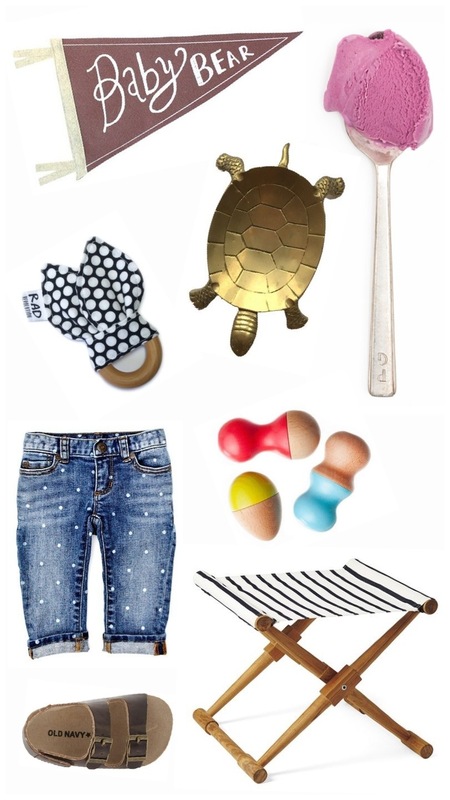 Brimful has an assortment of simple, but cute baby items. These rattles are no exception! 7. Love the look of this stool. This is a super expensive option and a little out of our decorative budget. Darn! On the hunt for something similar! 8. I saw these sandals in store the other day and I about fell over. They were so tiny and I could just see our little munchkin’s feet running/crawling around in them next summer! What about you all? What are you loving this week? Hope you all have a wonderful Monday!